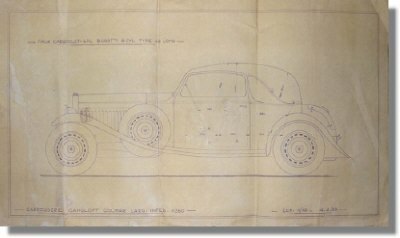 1933 Bugatti Type 49 Bodywork Blueprint - Gangloff 4 place Faux Cabriolet. A great vintage item from Carrosserie Gangloff! This blueprint shows (in scale 1/10th) the external shape and internal dimensions of the 4 seater Faux Cabriolet body designed by Gangloff to be fitted to the Bugatti T49 8-Cylinder chassis. Clearly visible are the "vane-type" wheels, so typical for the T 49. It was dated February 4, 1933 in the vellum. The blueprint measures some 22 x 12.5 inches or 55 x 31 cm.